Your event reminders and confirmations just got smarter. 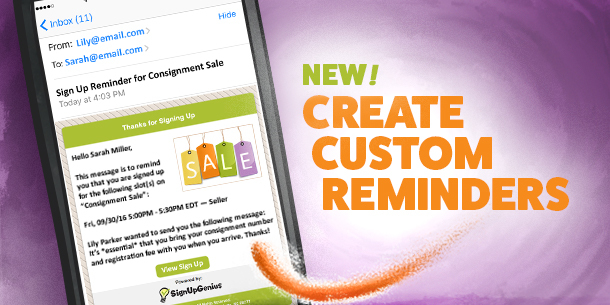 Our newest feature provides SignUpGenius Pro customers another level of customization for their messages. Pro users can now create personalized reminder and confirmation messages that communicate more information to participants. You want to send event volunteers extra information in their reminder emails — such as where to check in or what to bring. You want to attach files to your email reminders. Helpful if participants need to bring a waiver or other document along with them. You need to include a phone number or website link where participants can notify someone if they need to cancel an appointment or commitment. Learn more about our favorite tools for organizing fall events here. Happy planning! Every email that is sent from our site contains a link to the associated sign up(s). As long as names are not hidden on your sign up, your volunteers will be able to click the link to see which slot(s) they are signed up for. If names are hidden, you can either manually list what they've signed up for or direct them to log into their account to view their sign up under the 'Items I've Signed Up For.' The sign up information is not automatically included in a manually generated email, as with the reminders, but you can email everyone signed up for a particular slot. To do this, select *Messages* located on the left side of your account page. Select a Sign Up from the drop-down list of options. When you select that option, a table will display all those who have signed up for each slot on the sign up. You can then check the appropriate slots to email those specific people. You will have the chance to view a confirmation screen indicating the people who will receive your message. Enter the subject and text of your email. Choose *Preview & Send* or *Save Draft*. I have a follow-on question related to this topic. I understand that I can send a manual email, but is there a way that I can have that email include the slot for each person? My understanding is that the automatic reminder email tells the user which slot they signed up for. Is there a way to include that information in manually sent emails? The automatic reminders can be scheduled up to one day in advance, and no less than that. However, you can send a email manually to those signed up. Please log in to your account and click *Messages* located on the left side of the account page. Next, you can choose the sign up you wish to include in the email by choosing *Select a Sign Up* from the drop-down list. Choose who to send the message to by clicking the *Select People* option. From here, you can select to send the invite to an existing group or you can choose to *manually enter email addresses* or *import emails from your provider*. You can then enter the subject of your email along with the text of the email message you wish to send. Choose to *Save Draft* or *Preview & Send*. We would like to be able to notify participants the morning of the day OF the event instead of the day before. Is that possible or something that can be added? Yes, the automatic email reminders can be scheduled to be sent a specific number of days in advance. To do that, please go to SignUpGenius.com and login to your account with your email address and password. Click the pencil icon to the right of your sign up to edit your sign up. Go to: 'Step 5: Settings' to view the reminder email setting under the 'Miscellaneous Preferences.' If you make any changes to this area, remember to click the 'Update' button at the bottom of the screen to save the changes. Customized reminders work the same way as the regular basic account reminders. They are sent automatically to those signed up a certain number of days in advance of your event based on the setting in Step 5 under the 'Miscellaneous Preferences.' The reminder will apply to the entire sign up, so it cannot be customized based on individual events on a multiple date sign up without editing the reminder after previous events have ended. Can the reminders be scheduled so they can be sent automatically? I was wondering how one can customize the reminder message that will be sent to everyone who is signed up for a particular event, without having to add every person separately. Is that possible? I will be happy to walk you through the steps to create a customized reminder. Log in to your Pro account and go to *Messages* located on the left side of your account page. Enter the subject and the text of the message you wish to send. Select to add any *Attachments* from the GeniusDrive if needed. Assign this reminder to the appropriate sign up by choosing the sign up from the: *Select a Sign Up* dropdown. When all fields have been entered on this page, click *Preview & Save*. You will then be able to view a preview of the customized reminder. Your custom reminder template is now saved and ready for use. If you need to edit it in the future, simply click on the *Drafts & Templates* tab in *Messages*. To assign this template to a new sign up that you create in the future, choose the *Advanced Settings* on *Step 5: Settings* when you create your sign up. The process for confirmation emails is very similar if you choose that option in Messages. Can you please point me to the directions for using this new custom reminders and confirmation tool? Thanks.